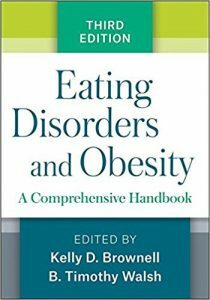 [amazon template=image&asin=1462529062]Acclaimed for its encyclopedic coverage, this is the only handbook that synthesizes current knowledge and clinical practices in the fields of both eating disorders and obesity. Like the prior editions, the significantly revised third edition features more than 100 concise, focused chapters with lists of key readings in place of extended references. All aspects of eating disorders and obesity are addressed by foremost clinical researchers: classification, causes, consequences, risk factors, and pathophysiology, as well as prevention, treatment, assessment, and diagnosis. *Reflects 15 years of important advances in both fields, including state-of-the-art intervention approaches and a growing focus on how the brain regulates eating behavior. *Dozens of entirely new chapters. *New topics: epigenetics, body weight and neurocognitive function, stress and emotion regulation, the gut microbiome, surgical devices for obesity, food labeling and marketing, and more. *Expanded coverage of prevention and policy.